What is a BAR CAMP? UXcampAMS is based on a BarCamp format where attendees set the agenda and create the content. All attendees are offered a chance to lead a 45-minute presentation, discussion or workshop (we suggest 35 mins for the session + 10 minutes for Q&A). As a potential presenter, you will pitch your session in the morning during the “Madness Session”. These pitches should be clear and to the point, lasting no more than 30 seconds. We can get pretty strict on that. Last year we even had a gong….so you’ve been warned! Example of a "Pitch Card"
After the schedules are finalised, breakout sessions will commence. There will be two rounds of sessions before the lunch break scheduled for 13:00. After lunch, there will be a further three rounds of sessions. The day will end with a few closing words from the organisers and an after party to have a drink or two with your fellow attendees. 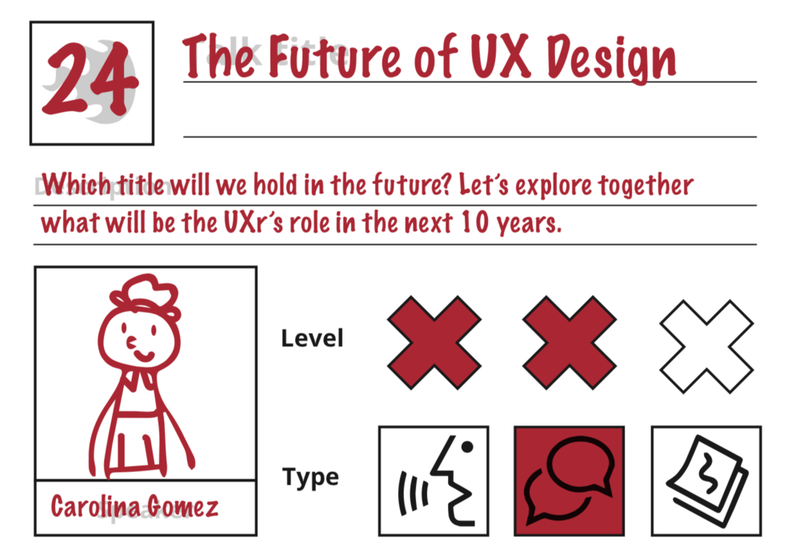 The key themes of UXcampAMS are involvement, inclusion, community and learning. Everyone is a participant and even if you are not presenting, your contribution to the sessions and assisting us with the organisation of the event is greatly appreciated. During sessions, we encourage participation and engagement. This could include asking relevant and smart questions to presenters, sharing your experiences and insights on the topic, active participation in a discussion or assisting workshop leaders to set up their sessions. Share your UX story in a session! Help with the event logistics! In case you have no presentation or workshop ready at the moment, you can help us with the general logistics of the event. We will ask you a few questions during the registration process for the ticket. There you can let us know how and where you would like to participate! This could be as simple as moving chairs after the madness session, cleaning up after the event, assisting with registrations or directing attendees to the after party! You can also convince you company to sponsor UX Camp and ensure we have amazing food, drinks and so on. Have a look on our sponsoring page for more details.